O’Brien interiors Ltd in conjunction with dry linings division are experienced in the installation of all types of suspended ceiling. These consist in the main of a lightweight metal modular grid construction consisting of a inverted tee suspended on wire or angle hangers, into the rear of this grid can be placed numerous forms of panel or tile to suit the room needs as to acoustic, aesthetic or thermal requirements. There are different types of suspended ceiling which utilize metal or fibreglass tiles with either exposed or concealed grid systems for more demanding locations such as kitchens, laboratories or the like. 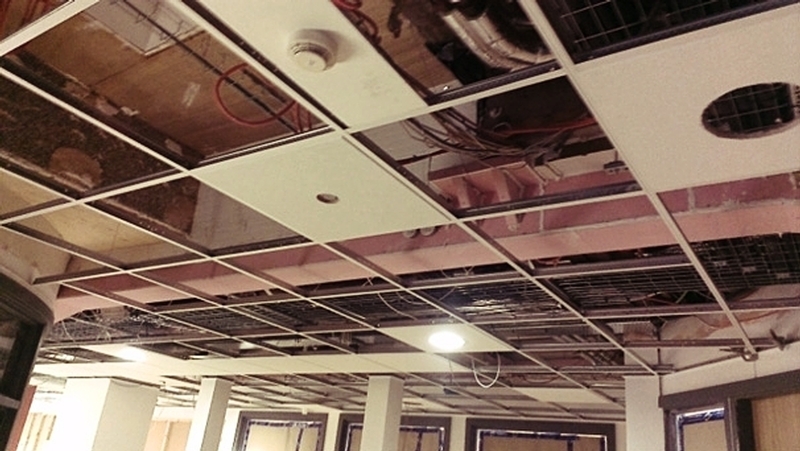 In terms of practicality, suspended ceilings are durable, provide a level of fire protection to the materials holding the original ceiling above, and they are easy to maintain and clean. Furthermore, both in terms of functionality and aesthetics, suspended ceilings can cover unsightly pipes and electrical wiring, as well as adding sound absorption benefits.